Daniel MacIvor is new to me but a well-established and well-liked playwright and actor in Canada. He is perhaps best known in both roles for a series of solo works with gay themes. In The Best Brothers, the cast expands to two and Mr. MacIvor undertakes the part of straight architect Hamilton Best whose gay brother Kyle (John Beale) is a constant source of irritation, never more so than on the occasion of their mother’s death. Mom was crushed to death when a large and intoxicated drag queen, Piña Colada, tumbled off a float at a Gay Pride parade which she was attending, Hamilton insists, in hopes of finding a husband for Kyle. Hamilton’s annoyance with Kyle, however, has little to do with his sexuality. It’s more a question of “Mom loved you best,” which will be familiar to all but the only children in the audience. 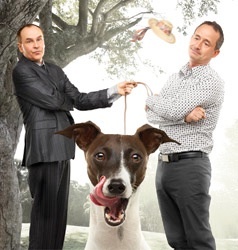 Hamilton and Kyle work out their “issues” amusingly and believably as they arrange their mother’s funeral, conduct a memorial service, and struggle with how to handle her property, most vexingly the care of her beloved pooch Enzo. From time to time the actors take turns donning green gloves and a wide-brimmed green summer hat to channel their mother. At play’s end, when the brothers have made their peace with one another and their dead mother, sliding upstage panels in Julie Fox’s understated set open into a green void into which Kyle and Hamilton stride in the persona of their mother. It’s a deft touch that reminds us of how much of their mother is in each of them. Hirsch is less successful. John Hirsch was a former artistic director of the Stratford Shakespeare Festival. With a mercurial temperament and, so we hear, a pronounced nasty side, he was both beloved and reviled, often by the same person. Orphaned by the Holocaust, he brought a dark Hungarian Jewish perspective to the plays he directed at the Festival, which were by all accounts exceptional. He died too young of AIDS in 1989. Alon Nashman and Paul Thompson have created a one-man show that is a sort of impressionistic pastiche of Hirsch’s life and career, with Nashman playing Hirsch and Thompson directing. Most one-person shows based on historical characters serve as an alternative to reading a biography of the subject; we come away with a pretty good idea of the arc of their life. Nashman and Thompson have attempted something a bit different. Against biographical snippets they paint a portrait of the artist, hoping to elucidate the sources of his artistic vision, in short what made him tick. Perhaps had I known more about Hirsch or, better yet, had seen his work at the Festival, the play would have “spoken” to me more. Nashman makes an earnest and believable Hirsch and he gives an affecting performance, but as a piece of theater Hirsch eluded me and so then did Hirsch himself. I should note that mine is a minority opinion. Reviews have been laudatory and most in the audience when I saw it received it well. Both plays are short, about 90 minutes, and played without intermission.